Ari's In Wonderland: How to Work That Tacky Blue Eyeshadow! How to Work That Tacky Blue Eyeshadow! 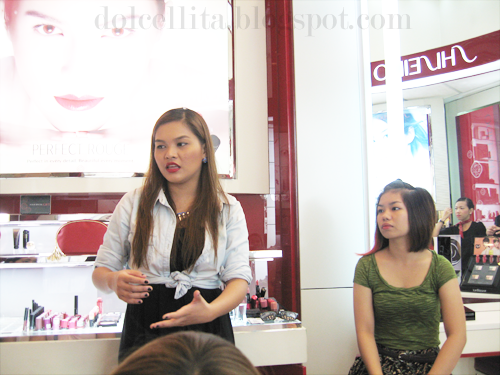 Last Saturday, I was one of the lucky twelve people chosen (link) to attend a makeup workshop hosted by none other than Martha from The Beauty Junkee at the Shiseido boutique in Greenbelt 5. I've been a reader of her blog and a personal fan of hers since last year so I was very excited to be part of the VIP list! I'm also a huge lover of anything Shiseido, particularly their makeup line, so you could say it was a win-win situation for me. The theme of the workshop was "How to Work That Tacky Blue Eyeshadow". Blue eyeshadow sadly has an almost universal reputation of being a 'tacky color' to work with when it comes to makeup, especially if not done right. In this country, it's seen as the cheap color that many sales ladies in malls or department stores wear. Here, Martha tells us that it's important to choose what kind of blue shades to work with, and to apply them properly, in order to avoid it from looking tacky in the first place. 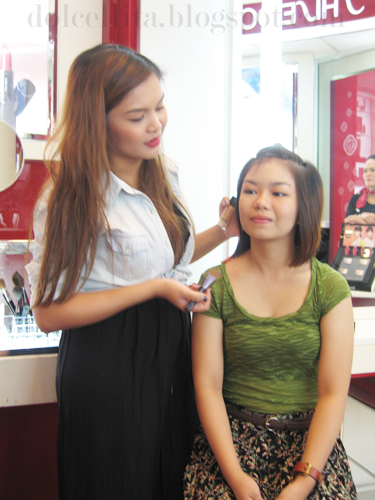 Since she's planning to do a full look, and working with her model, Martha first applies liquid foundation. Sorry, I forgot to take note which specific foundation she used, but I believe it was their Perfect Refining Foundation (?). Move your foundation brush side to side when applying to your forehead to ensure even application and allow the foundation to cover and sink in between the 'lines' that some of us have there. She highly recommends the Shiseido Perfect Foundation Brush (link) to achieve a flawless finish. Now her model has smooth, flawless looking skin that also looks natural! 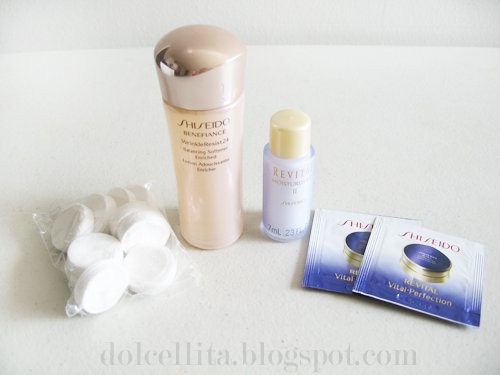 To set the liquid foundation, Martha then lightly applies Shiseido's Perfect Smoothing Foundation (link). She raved about this particular powder foundation and said that if you were going to buy just one powder, this would be it. You can also read about her review of it here! I tested it out myself after the workshop and I loved how smoothly (hence, the name) it glides onto the skin, thanks to its very fine texture, while providing medium coverage at the same time! Before working on the eyes, Martha applies a cream shadow first on the model's eyes to work as a primer and initial base. If you don't have an eyeshadow primer handy, an equally great alternative would be to use a cream shadow that's the same or similar to the eyeshadow base color you'll be using. 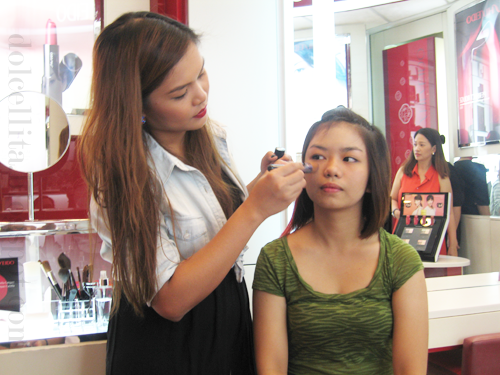 Here she's using a Shiseido Shimmering Cream Eye Color (link). Now it's time for the main focus of the workshop, choosing and applying that blue eyeshadow. Using the Luminizing Satin Eye Color Trio (link) in "BL310 - Punky Blues", Martha shows us how to create a smooth gradient on the eyes by working with a mid-tone blue shade, and a slightly darker one, then blending everything together. She also used and blended in the "VI308 - Bouquet" eyeshadow trio as the lavender shade in it highly complimented the blues. "Light is to light, dark is to dark" is what was emphasized. If you have fairer skin, like me, stick with light blue shadow colors, such as pastel shades. Those with medium skin tones, such as the model, are lucky as they can work with almost any shade. Invest in a good quality, fluffy eyeshadow brush. Not only can you apply color, but you can use the same brush for blending purposes after. If you're working with two shades, use the lighter one as an all over base, and the darker shade to compliment it by blending it into both the crease and the lighter shade itself. In case the lighter shade is no longer seen as prominently, you can always retouch it by going over it again on your lid. Instead of stopping the shadow at the outer corner or very edge of your eye, don't be afraid to blend out a little past it. It actually makes it look more natural. Next, mascara was applied. Sadly, I'm unsure if she used the Shiseido Perfect Mascara (link) in "Full Definition" or "Defining Volume"! Lastly, blush was applied as well as a matte bronzer (link) for some light contouring. Again, I don't recall which blush was used, but I'm pretty sure it was the limited edition Shiseido Camellia Compact (link). A dusky rose lipstick from their Perfect Rouge line (link) was added as the final touch to compliment the model's blush. If you want a more fresh and youthful look, apply your blush onto the apples of your cheeks. For a more mature look, apply only onto the outer edges of where the apples of your cheeks are. If you have visibly red acne on your cheeks, 'bounce' the blush brush lightly along your cheeks during application instead of 'sweeping' it to give it a light, natural finish while not emphasizing the already existing redness. Apply your bronzer with a round, fluffy blush brush instead of the traditional angled brush as the end appearance will look less like you just have a streak of bronzer running across your face and come out more natural. The model and the makeup artist! I think she looks fabulous, don't you? All the colors compliment each other beautifully and she doesn't look tacky in the slightest. In fact, she looks super fresh faced! Martha officially destroyed the reputation of blue eyeshadow as being a color we should avoid working with. 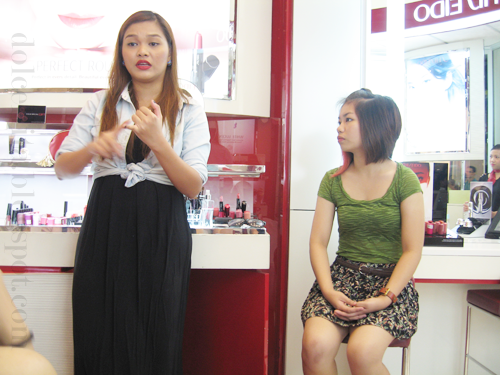 Martha with Jen, the Shiseido brand manager, thanking us for attending the workshop. We received our complimentary goodie bags after. I couldn't wait to open it when I got home! The contents of said goodie bag. Thank you so much to Martha and Shiseido for a wonderful day filled with lots of helpful tips and advice, and for the samples and treats! Even for someone like myself who's passionate about beauty and makeup and consider myself confident with it, I definitely still learned a great deal. Don't forget to check out and subscribe to Martha's blog The Beauty Junkee and follow her on both Instagram and Twitter. 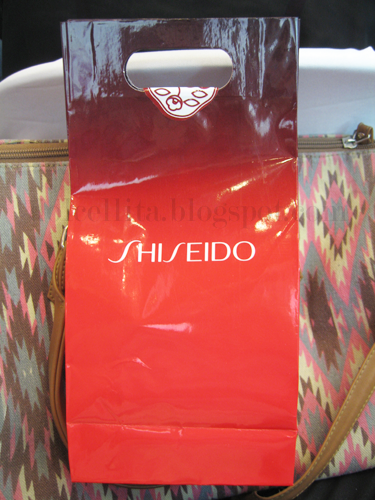 Also, follow Shiseido Philippines on Twitter and like them on Facebook. I've always wanted to wear blue eyeshadow but I always stop myself especially when I'm going to the mall! hahahaha! I think blue eyeshadow can give a wonderful pop of colour if used correctly - especially if it's blue eyeliner! I tend to play it safe with my eyeshadows and stick to more neutral colors. But I love playing around with colorful eyeliner, definitely!